When college student Ken Kaneki snags a date with the beautiful and enigmatic Rize, he thinks it seems too good to be true. And indeed it is- it turns out Rize is a ghoul, a race of supernatural beings who feed on the human population. Her dinner plans involve him, and not the way he was hoping for. Awakening in a hospital bed after the attack he discovers he only survived because an enterprising surgeon took it upon himself to transplant some or Rize's organs into his body. Trying to return to his normal life, Kaneki soon finds himself overcome with strange new cravings. Tokyo Ghoul's first 12 episode season was produced by Studio Pierrot and is based on the popular manga of the same name by Sui Ishida. The series was directed by (the once Oscar nominated) Shuhei Morita, and originally aired between July and September 2014. Kaneki is taken in by the owner of a local coffee shop, Anteiku, a kindly ghoul who has pledged to help ghouls who are unable to help themselves. With the help of the owner and his fellow staff, he discovers the secret world of the ghouls and tries to come to terms with his new half-ghoul status. 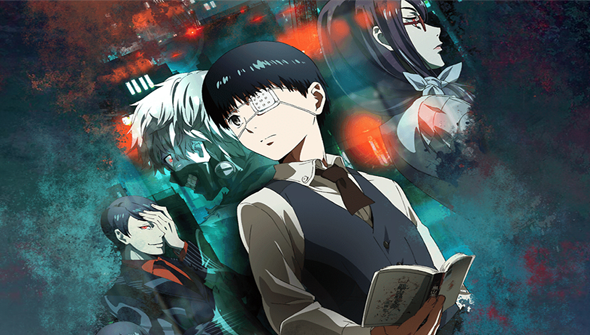 Tokyo Ghoul's real strength is in its world-building and lore. The series creates an absorbing shadow society that exists just beneath the everyday world. The ghouls themselves are an intriguing mix of vampires and zombie, with a few extra twists of its own. Ghouls possess Kagune, a sort of supernatural extra limb or appendage that they can use to hunt humans (or fight fellow ghouls). These make for some particularly flashy and gory action set pieces, that recall a superior version of those seen in Parasyte or Elfen Lied. There are other small details in the ghoul lore- for example the fact that coffee is the only human food or drink that ghouls can enjoy, or the masks the ghouls wear- that serve to build up the show's world further and give it extra depth. It feels like a lived-in and well-realised world, and makes you want to explore it further. The characters, too are well-drawn for the most part. Making characters likeable when most of them eat people is no mean feat, but the series pulls it off. It creates sympathetic characters on both sides- both human and ghoul, 'good' ghoul and 'bad' ghoul. alike. Unfortunately, the main character himself is one of the weaker elements. While it may be completely understandable that he reacts as he does to his new half-ghoul status, it doesn't make for the most compelling viewing. We're told that half-ghouls are supposed to be stronger than their full-blooded brethren- but it's only later in the series do we see him finally come into his own. By contrast, Rize - unhinged as she is- may well be the most entertaining character in the series- so it's a shame that (spoilers) she's apparently killed off in the first episode. Her connection with Kankei means her presence is still felt throughout the series, but it might have been more interesting if she was kept around at least a while longer. The series offers some impressive visuals, that are suitably dark for the most part. The characters are well designed and have a distinctive look. Understandably, the visuals in the show itself are a step down from the stunning manga-style artwork featured in the closing titles, but even so... this show is a looker. 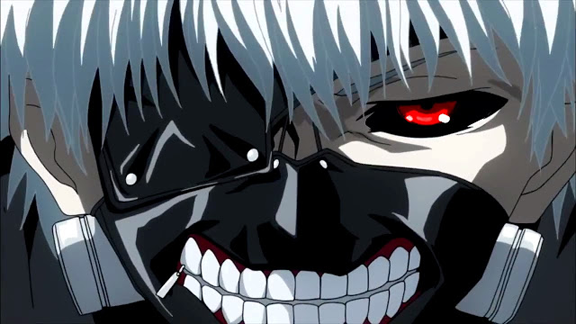 Tokyo Ghoul is not for the squeamish- it is easily one of the most violent and gory anime for some time. And it's not just the on-screen violence- the series also goes to some pretty dark places and really puts its characters through the wringer. Tonally though, it fits, and thanks to the excellent characterisation, it never feels unearned. 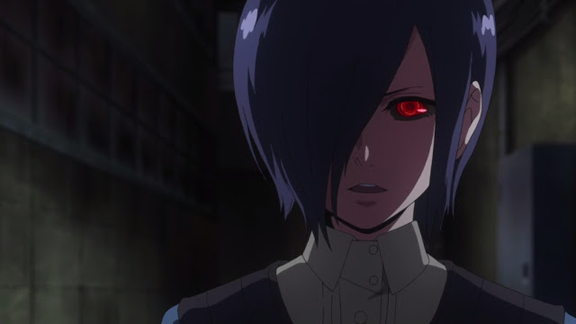 Assuming you have the stomach for it, Tokyo Ghoul is one hell of a good time. Creepily atmospheric, action-packed and full of memorable characters, this is one anime that horror fans should not miss.